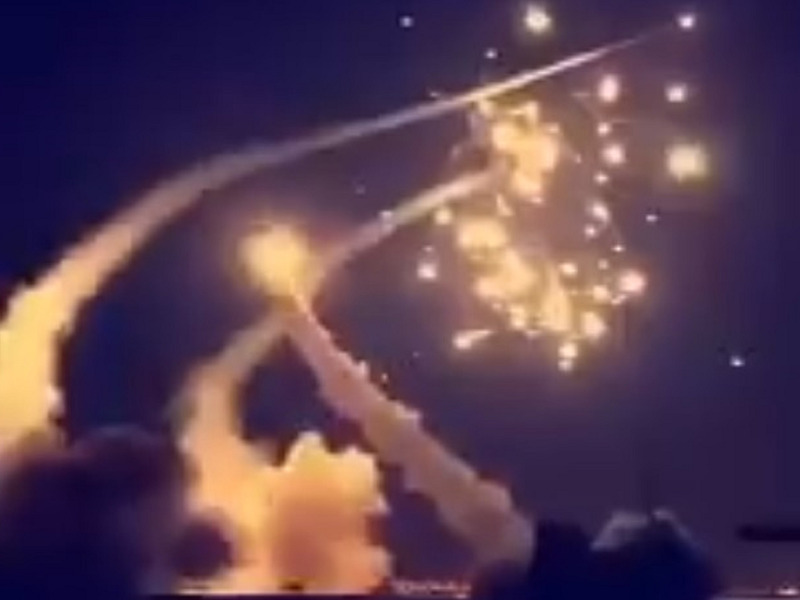 Screenshot via Twitter/Rosie PerperSaudi Arabia’s missile defence system intercepting several missiles fired from rebel Houthis. Saudi Arabia’s missile interceptors may have “failed catastrophically” in their attempts to shoot down several missiles headed toward the capital of Riyadh over the weekend, one expert said. One person died and two others were injured from shrapnel, according to a news outlet based in the United Arab Emirates. Yemen’s Houthi rebel group has launched dozens of missiles in recent months. The latest launches coincided with Saudi crown prince’s visit to the US. Saudi Arabia’s missile interceptors may have “failed catastrophically” in their attempts to shoot down several missiles headed toward Riyadh over the weekend, according to one expert. Seven ballistic missiles launched from the Yemeni Houthi rebel group were intercepted on Sunday, according to the Saudi Press Agency. The National, an English news outlet based in the United Arab Emirates, reported that one person died and two others were injured by shrapnel over Riyadh. Jeffrey Lewis, the director of the East Asia Nonproliferation Program at the Middlebury Institute of International Studies,said on Twitter that in video footage released of the missiles, it appeared one defence system “failed catastrophically” while another “pulled a u-turn” and exploded over Riyadh. Lewis said it was “entirely possible” that the defence-system failure rather than the missiles themselves led to any casualties or injuries. “Will have to see where debris fell, impact points, and where people were killed/injured before we can make educated guesses,” Lewis tweeted. The militant group has been protesting Saudi Arabia’s role in Yemen’s bloody civil war and has engaged in an increasingly violent border conflict with the kingdom since 2015. Experts say Sunday’s barrage could be the largest number of ballistic missiles fired at once by the rebel group since the war escalated four years ago. The Houthis have launched dozens of missiles in recent months, including one in November at Riyadh’s King Khalid International Airport. Saudi Arabia has said it downed that missile, while the Houthis say it reached its target. The latest strikes coincided with Crown Prince Mohammed bin Salman’s visit to the US, signalling that they may have been a display of disapproval by the Iran-backed rebels. On Thursday, US Defence Secretary James Mattis urged the crown prince to pursue “urgent efforts” for a peaceful solution to Yemen’s civil war.